When planning any heterologous expression experiment, the very first critical step is related to the design of the overall strategy, hence to the selection of the most adapted expression vector. The very flexible Pichia pastoris system offers a broad range of possibilities for the production of secreted, endogenous or membrane proteins thanks to a combination of various plasmid backbones, selection markers, promoters and fusion sequences introduced into dedicated host strains. The present chapter provides some guidelines on the choice of expression vectors and expression strategies. It also brings the reader a complete toolbox from which plasmids and fusion sequences can be picked and assembled to set up appropriate expression vectors. 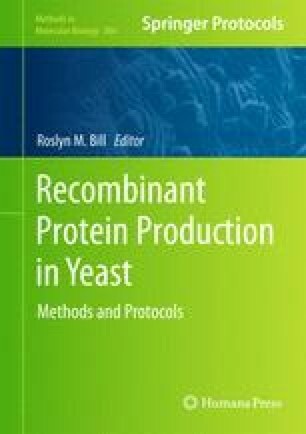 Finally, it provides standard starting protocols for the preparation of the selected plasmids and their use for host strain transformation.